A U.S. Energy Administration study shows that nearly half of a building’s energy costs – 44 percent – go towards heating and cooling. Of that, 30 percent is used inefficiently, according to ENERGY STAR estimates. The primary culprit? Leaking air, resulting from original building construction; hairline cracks in brick; ground movement; and multiple cycles of contraction and expansion. 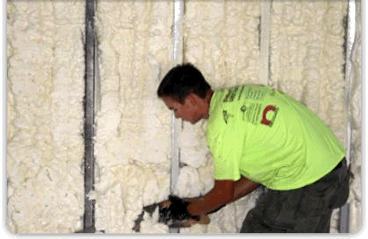 Even a building with abundant insulation can be drafty if it doesn’t have a tight air seal. But, you can change the equation using DFW Urethane’s proven weatherization services. Not only do air-sealing projects in commercial buildings deliver energy savings of up to 40 percent*, they usually pay for themselves within five years. Those savings go straight to your bottom line. DFW Urethane has partnered with Honeywell, named one of the “Most Admired Companies” in the world by Fortune magazine, to provide high-performance weatherization services in Dallas-Ft. Worth and surrounding areas. Honeywell provides the engineering and conducts a cost analysis to determine the available savings. Then we perform the weatherization, sealing off air leaks with sprayed polyurethane foam insulation and weather-stripping. Because we are certified Honeywell Authorized Weatherization Contractors, we have the training and equipment to locate and seal air leaks throughout your building, using proven products and processes. What’s more, we can point you to utility or government rebates that may provide you with additional savings. Improved comfort – Eliminating air leaks makes it easier to maintain a constant temperature. It also blocks noise and reduces odor transfer, leading to fewer complaints. Air quality control – A sealed, properly ventilated building means less dust, dirt and excess humidity. Improved safety – Weatherization slows the spread of smoke in the event of a fire, and reduces the litigation risks associated with a sick building system or smoke transfer illness. Efficient operation – Sealing your facility keeps the elements out and conditioned air in so your HVAC systems don’t have to work as hard. The energy saved reduces your building’s carbon footprint. Fewer unwanted pests – Sealing your building can help minimize pest and insect infestations. Improved equipment life – HVAC equipment that runs less often is likely to last longer. A more durable building – Proper sealing can prevent damage from “sweating” in humid conditions: dripping moisture, mold and other problems. Improved resale value – The National Association of Realtors estimates that every dollar spent on energy improvements can bring an additional $25, on average, at resale time. The sooner you get started, the sooner you can learn how much our weatherization services can save you. As a certified Honeywell Authorized Weatherization Contractor, DFW Urethane offers you the best of all worlds in weatherization here in Dallas, Fort Worth, Austin, San Antonio, Texas and Oklahoma. * The National Institute of Standards and Technology (U.S. Department of Energy) estimates that weatherization in commercial buildings cuts gas costs by more than 40 percent and electricity costs by more than 25 percent.